TWO MEN USED fake weapons to hijack a Libyan plane with 117 people on board and divert it to Malta, before releasing everyone and surrendering. 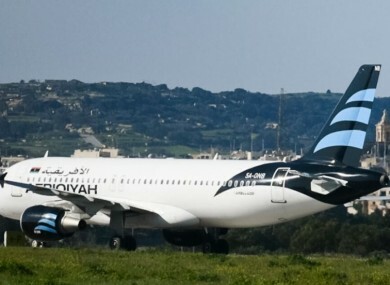 The Afriqiyah Airways Airbus A320 was en route from Sabha in southern Libya to the capital Tripoli when it was taken over and forced to fly to Malta earlier today, sparking a four-hour runway standoff. The men had claimed to have a grenade when they took over the plane. It was diverted to Malta where everyone on board was released and the hijackers surrendered to authorities, officials have said. “Final crew members leaving aircraft with hijackers,” Maltese Prime Minister Joseph Muscat said on Twitter. Libyan Foreign Minister Taher Siala said the two hijackers were supporters of slain dictator Muammar Gaddafi and had requested political asylum in Malta. Siala, from Libya’s internationally backed Government of National Accord, said the hijackers also said they want to set up a pro-Gaddafi political party. The plane landed in Malta just after 10.30am Irish time. After more than an hour on the tarmac, the door of the Airbus A320 opened and the first group of women and children were seen descending a mobile staircase. Dozens more passengers were released minutes later following negotiations that Maltese government sources said were led by the head of Malta’s military. The Libyan government confirmed the plane was diverted after leaving from Sabha in southern Libya. Malta state TV earlier reported that the hijackers had hand grenades and were threatening to blow up the aircraft. Forces loyal to a fledgling national unity government recently took control of the coastal city of Sirte, which had been a bastion for the so-called Islamic State group since June 2015. Western powers have pinned their hopes of containing jihadism in the energy-rich North African state on the government, but it has failed to establish its authority over all of the country. A rival authority rules the country’s far east, backed by the forces under military strongman Marshal Khalifa Haftar. They have been battling jihadists in second city Benghazi. Email “Two men used fake weapons to hijack Libyan plane”. Feedback on “Two men used fake weapons to hijack Libyan plane”.